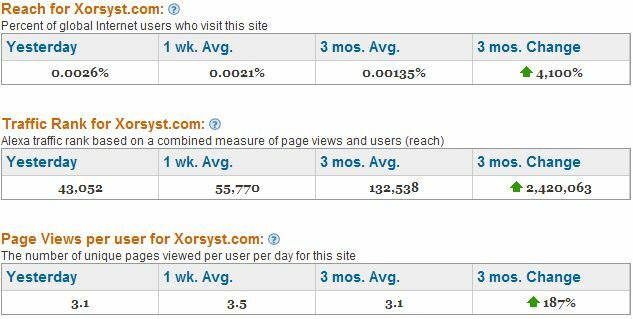 Well another month has passed by on xorsyst.com. April was such a great month for me, as well as for the blog. I have moved to Jacksonville FL to be closer with family, and so far I am enjoying the city. I haven’t lived on the Atlantic coast since I was a kid. So its nice to see real waves for once. Ok, on to the stats. Unique visitors for April totaled out at 71,368. Last month, I had 45,178 pageviews (Google Analytics), WordPress reported that number was actually 48,719. I didn’t think I would double that number again for the 3rd month in a row, and I gave myself a more conservative goal of around 80,000 pageviews. However, not only did I surpass 80,000 pageviews for the month of April, I doubled it yet again! My official pageview count is 104,613. I can honestly say doubling that yet again to 200,000 pageviews seems like a hefty goal, and maybe unrealistic. But hey, I can try! The RSS subscription is at around 190 readers as I write this. Thanks everyone that found my blog worthy enough to be added to your reader! Also, with the next Alexa update, I should be even lower. I cant wait. 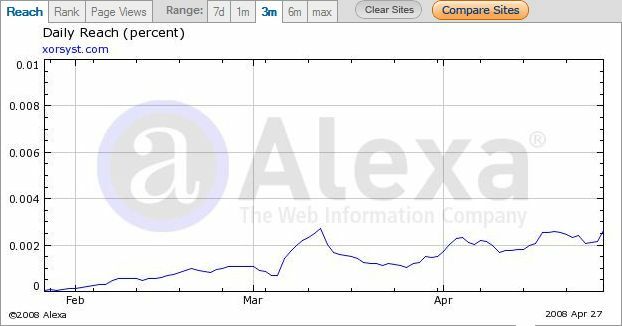 So what did I do differently to gain this much traffic? Along with my usual research of what to write about that contributed greatly to the increase of stats, I tried a few new things this month. One of the biggest gainers in my referrers was Dannychoo’s Otaku.FM. If you have an Anime/Otaku/Japan related blog, I would highly recommend you make an account there and get your RSS feed on Otaku.FM. Not only have I seen an increase of traffic, but also I have seen many new visitors and comments from others with blogs. My only regret with Otaku.FM is that I didn’t have my site on there sooner. I have also begun to use Project Wonderful for not only offering advertising on this site’s sidebar, but to advertise this site elsewhere. Project Wonderful offers unbelievably cheap advertising on many different types of sites. Without giving you the exacts (you can easily find the site I am talking about in Project Wonderful‘s directory), I was able to purchase a banner on a site that has over 200,000 pageviews a day for only $0.20! Yep, that’s 2 dimes for 200,000 pageviews. All sorts of deals exist on Project Wonderful if you take the time to look. At some point of another, if you want your blog to become even bigger, you are going to need to advertise it, and get your blog out in front of people that might find it interesting. Project Wonderful is an easy first step that wont cost you an arm and a leg. With my increase of traffic, I have decided to venture into private advertising. As a reader, the only thing that you will notice is that the banners on my sidebar will change, but that’s it. Same size, same location. I have bought a plugin that I have been experimenting with all week. I feel it was a good purchase as it will handle everything I need. It’s called OIOPublisher. The feature list is too long for me to talk about here, so if you are thinking about private advertising for your blog, you may want to check it out. With that same idea in mind, I am also going to use my server’s built in statistic pages to count the number of unique visitors. Again, it doesn’t matter what the user has enabled or disabled, if the server sees a visitor hit a page, it is going to count that user. I am not alone. Many sites tend to use AWStats as their stats program of choice. I finally understand why.